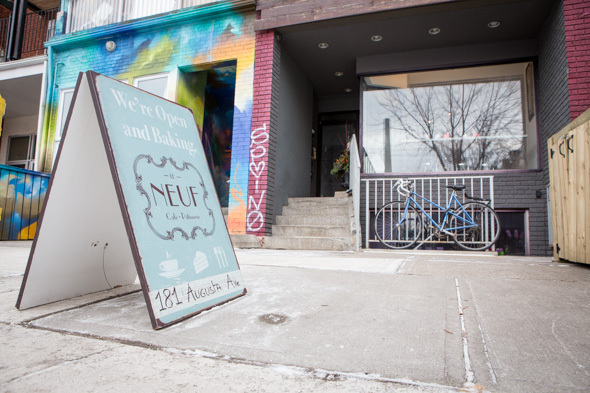 Le Neuf Cafe has already established itself on Clarence Square and now has branched out to open a second outpost on lower Augusta in Kensington Market. 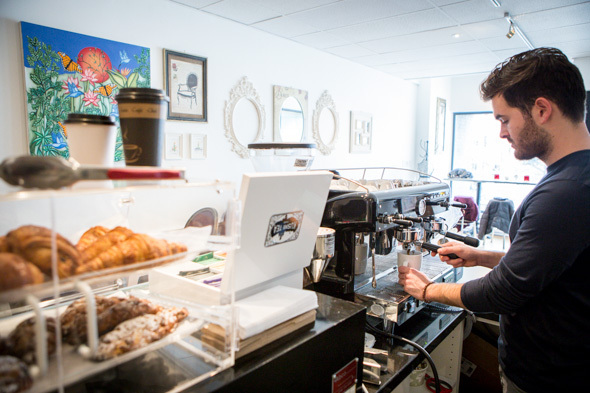 While there's no shortage of coffee houses (or bakeries) in the area, the mother-son team of Fouzia Zern and Quentin Chouve saw an opportunity to introduce their niche patisserie to a neighbourhood where it would stand out as unique. 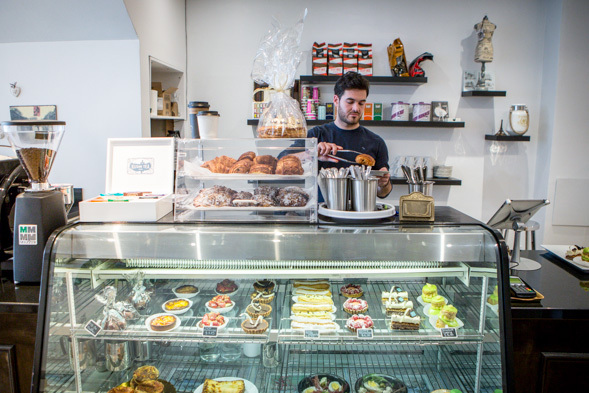 Pastry chef Hadrien Verrier was recruited directly from Paris, and has now consolidated baking operations for both cafes in the open kitchen at this location. 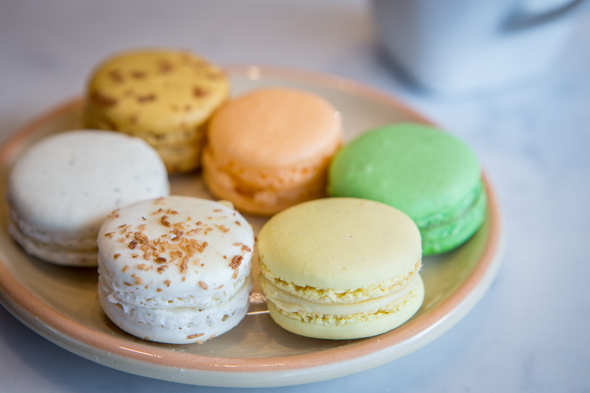 In Parisian style, the interior is painted stark white as if not to detract from the brightly glazed eclairs ($4.75), artful tartes ($5.25-$6.50), and colourful macarons ($2.50) on display. Seating is quite limited but they intend to add more furnishings in time for the upcoming launch of a brunch menu. At just a few weeks old, it's Rufino coffee, Kutsumi teas, and viennoiserie that are the main morning attractions. The assortment includes includes plain, almond and chocolate-almond croissants, as well as lovely, laminated pain au chocolat ($2.50-$3.50). 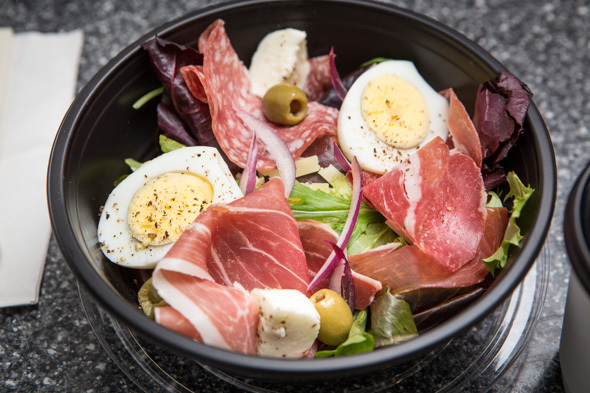 Examples of savoury items for grab and go include mini quiches ($4.80), and then there's seasonal salads ($7.50), like one crafted with hard boiled eggs, fresh mozzarella, cured meats and olives. While there wasn't a menu in sight, the counter staff was happy to relay that crepes and croque monsieur sandwiches ($9.50) can be made to order too. On this visit, I order an Americano ($3.50) and skip straight to dessert - drawn immediately to the religieuse pistache ($6) shellacked in glossy green glaze. 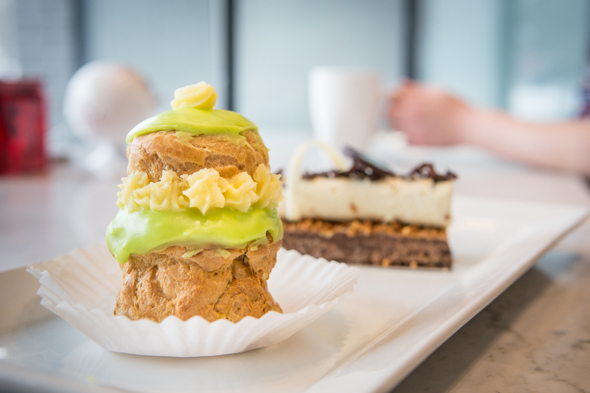 Overall, I think the piping could have been neater, but the freshness of the choux is impressive and most appreciatively, the pistachio cream filling was sweetened with restraint. Like the original La Neuf Cafe, this new spot has the good fortune of being positioned directly across from a park. Space for a patio out front, directly across from Bellevue Square is sure to become a chief feature in summer months.